Ah, Mother’s Day/birthdays. That day when you jut want sleep, but that’s not actually going to happen, so you settle for the next best thing of presents/flowers/dinner. All which are lovely, except sometimes the restaurant you go to is stiffly formal and a little too expensive, and it was good but not great- you know what I mean? I like eating out, but I always hope that it’s going to be better than just paying not to make dinner or do the dishes. That’s when you call it a practice round, and the next day you have the real birthday dinner, the one you wanted in the first place. This is also one of my favorites because it is indulgent without being unhealthy, fancy without being time consuming, and luxurious while still a budget meal (mussels are the cheapest of fresh seafood). Did I mention it’s also gluten and dairy free? Did I also mention the recipe uses half a bottle of wine, which requires you to have a glass of nice white wine with dinner???? Now, if you want real deal moules frites, I highly recommend this recipe from Saveur. 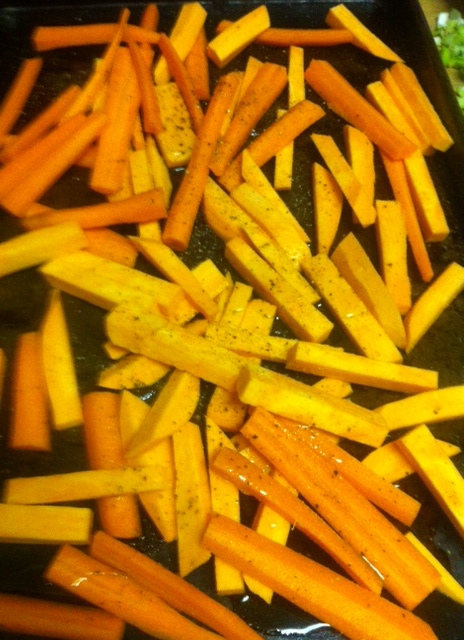 However, making the fries/mayo is a bit time consuming, and I also wanted a slightly healthier alternative- so I substituted fries with simple roast carrot and sweet potato batons. Normally I would say spice those two up with some Moroccan goodness, but I didn’t want them to compete with the mussels, so I just used some olive oil, salt, and pepper. As for the mussels, a few big tweaks and they turn out MUCH much better. Read on for the recipe! And (belated) Happy Mother’s Day!!! If you want to serve this with any sides, get those ready first. I roasted my veggies while I prepped and cooked this, and they were done just on time. 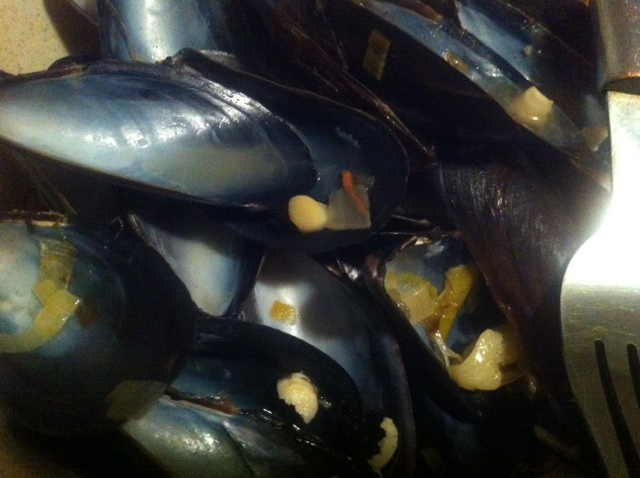 Mussels should be eaten right away though, so do a bit of advance planning for what will accompany them! Wash and debeard (if necessary) your mussels in cold cold water- if you use warm water they will start to open up before you have a chance to cook them. Heat up the oil in a large, deep (at least 2 inches) skillet, then add the leek. Cook for ~1 minute on medium high heat, then add the onion. Stirring frequently, let them start to caramelize, to pull out some of the sugar and bring some sweetness to the dish. Lower the heat to medium low, add the celery and garlic, and cook another minute or two until celery begins to soften. Add about 4 twists of fresh ground black pepper, and about 3/4 teaspoon of salt. Add a splash of the wine to deglaze the pan, then add the remainder of the 1 and 1/2 cups. Lower the heat slightly, then add the cleaned mussels. Stir occasionally, and cook for about 5-6 minutes, until all the mussels are wide open. The first time I cooked mussels, I made the mistake of only cooking them until they just cracked open, which left them tougher and less flavorful. If you give them some time, they will absorb the sauce and be much more tender. Bring the whole pan to the table to keep them as hot as possible, dig in and enjoy! !